..It’s been a while, so this article is going to get pretty dense for it’s own sake…. Over the last half-decade of my drumming, I’ve started using drum triggers with my acoustic drum kit, with Roland or (more recently) Dauz’s “bone” trigger pads wired into some form of brain. Even before I starting shopping around for e-drum options, I saw how much innovation has come (and gone) in various makes and models, so I started (and remain) wary to corner myself into any “all-in-one” solution, such as the Rolands V-drum system. I did not approach this looking for “better drums”, but looking to put a “effects processing layer on my kit”, such as a guitar player may collect and combine dedicated analog pedals (with their immediacy) or digital multi-effects (with their recall, and flexibility, and MIDI-compatibility). expressive sound-design, and if possible user samples, especially that could be looped. beyond being able to change between various “kits” of drum sounds (common to most e-drum systems, I wanted control and flexibility of the mixing of the additional sounds triggered by each drum, and their routing (to the above effects). I started building the “cybernetic prosthesis” to the kit back in 2007, for MusicForHeadphones, and started with the initial investment of the Alesis, DM-Pro; an amazingly well-spec’ed rack unit. This piece combines over a dozen trigger zone inputs with some jaw-droppingly expressive ROM-wave synthesis. It even allowed for user-waves to be loaded (through the short-lived SoundBridge middle-ware) onto (also dated) PCMCIA cards (max 8 MB… that’s less than 30 seconds worth of audio for my own drum sounds ! ). I may have readily married myself into a hardware headache, but the sound and the sound-design of the DM-pro was a game-changer in itself. Seriously, I have yet to see a drum-sound module before or since this unit that has a bona fide modulation-matrix (to map standard sources of expression to your choice of relevant results), let alone the unique expression-source of “Hit Rate”…allowing the increasing stroke-frequency within a press-roll to , say, conrol pitching or cross-fading between the 4 samples of each unique Voice. the magnificent Alesis DM-pro. Unit has since died. others (pad-only sounds not coupled to an acoustic voice). Behringer’s FX-1602 rack mixer. 8 stereo channels, each with level, pan, and aux/monitor send (which I’d use to tailor the mixing and effect-routing of each e-drum sound. Electrix MoFX. 4 stereo effect-engines, Distortion engages insert block. The other three (flanger, tremolo, delay/looper) can all sync to tempo, process any combination of hi/mid/low filter bands. All blocks have momentary/latch switching for “playing the effects”. see me throttling the pitch/time of of a loop caught in the delay block HERE (during the show finale). see someone else demo the various components here. However, I eventually added an additional rack-effect into the Mo-FX’s distortion/insert loop, even-more esoteric Korg AM-8000r, AKA, the “poor man’s eventide” (3 fx blocks, serial/parallel routing)…mostly used it to add unnatural ambience, such as reverb-into-flanger (“flerb”), or unnatural transience (with pitch shifters, gates, and compressors). Man I miss that HUGE alarm-lock display. Korg AM8000r (“ambience modulator”). each preset includes 3 band eq, 2 seperate multi-effect blocks (distortion, phaser, flanger, early reflection reverb, rotor, ring-mod, etc, etc), and a delay/reverb block, with flexible serial/parallel routing. A dream for sound-design concepts, and a nightmare to program (using only 1 Page knob and 1 Value knob…). 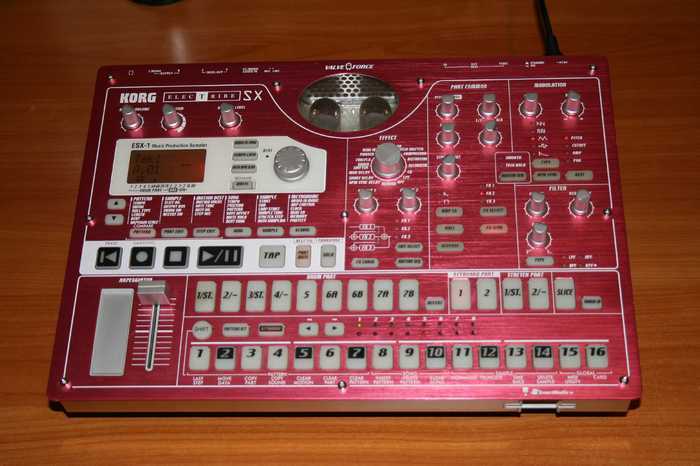 Each preset had an 8-channel modulation matrix, with expression sources including MIDI messages, foot-switches, and the front-panel Morph knob. This helped me do “dub” effects on the select e-drum that could twist complex delay-time/filter-sweep/ring-mod gestures with one finger. Fun ! Here is a picture of all the units involved. This is the only picture I could find of the whole “e-drum rack” all in one photo, in middle of migrating to a larger rack (bottom one). 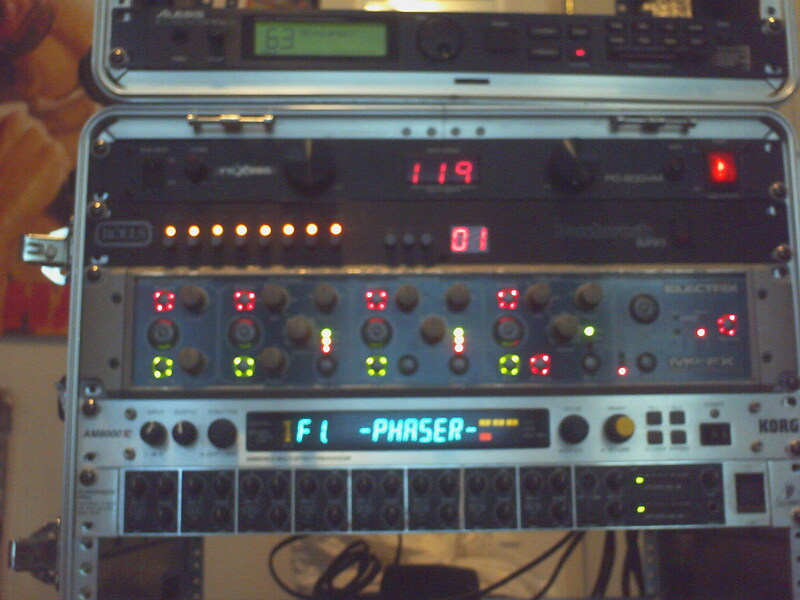 TOP to BOTTOM, the picture shows: Alesis DM-pro trigger/sound module (in old rack). Raxxess power supply (too heavy), Rolls router/switcher (failed experiment to extend mixer’s routing), Electrix MoFx, Korg AM8000r, and Behringer rack mixer. Below is a pic of how I’d use this rack box box, in context. The black rack box direct to my left, with the medical-tape bundled umbilicus of trigger cables that feed the v-drum pad and rim-mounted Dauz bone pads. However, while my head was enjoying all the new creative problem-solving of “drums with effects”, my back started to complain. 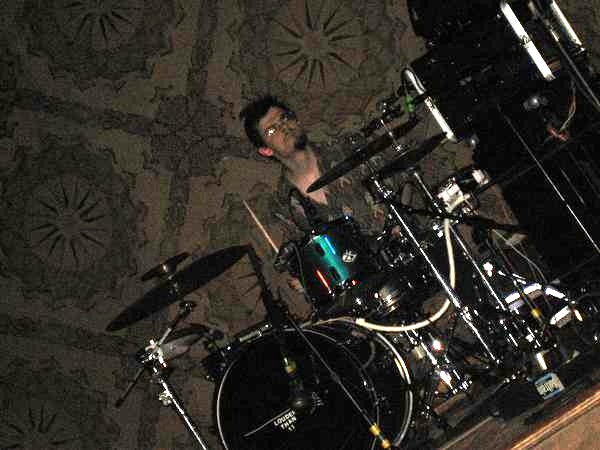 During MFH, my eDrum Rack was 65 pounds, and that was not counting the weight of the Roland and Dauz (bone) pads. I was also completely dependent upon house sound and monitoring to hear those e-drum sounds (which is another problem altogether). My first instinct was to lighten up on all available fronts. The heavy-duty rack box was just that, heavy. almost 10 kilos (with power supply mounted). So I got a lighter, folding rack. Here we see V2 put together (with the winning ESX sound module): half the weight of V1 (especially doing away with a rack-mounted power supply), but quite unruly… had to use a LOT of velcro to hold touchpad, power adaptors and power-strips into place. allowed for loading or user sound samples. 10 inputs, each with two separate sensors, that could receive arbitrary combinations of trigger-piezo or switch inputs. 20 kits that store standard or custom MIDI-note-assignment per input. Then came the problem of a sound module. This led to me having to buy, try, and integrate a parade of candidate drum-focused grooveboxes. The thinking/advantage here is that the sounds, mixing, and (hopefully) routing (dry, wet, or thru external KP2 effect loop) of each different song’s sounds could be stored on a per-program basis, and switched easily. Boss sp-202 sampler (that I had at the time. No clear info on sample names or MIDI notes assigned to each white pad (sample slot), so it was a bugger to program “kits” of electronic drum sounds to play. limited effects processing; while you could always choose which samples went through the effect (rather than straight “dry”), only one effect could be used at a time, and these were in no way tied to “kits”, so I couldn’t switch between different sound-sets with different effects (distortion on just kick for one song, reverb on just snare on another). one-sample-per slot (each memory slot with a unique/dedicated MIDI note), so any time I wanted to play a different “kit” of sounds, I’d have to use a different note-assignment on the Trigger IO’s end. the korg ESX: with some impressive/expressive sequencing, FX, tweaking of sound, and assigning names to sound samples and patterns, I was on the right track. The impressive Korg. 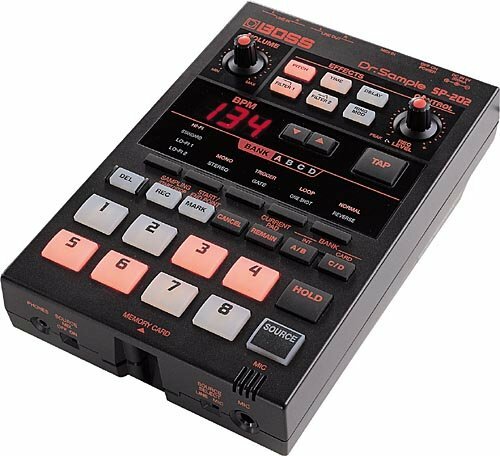 Electribe ES-X; while I had little use for the pattern sequencer (at the time) and no use for the 12ax7 tubes, it’s knobby interface, text-y screen, and flexible input/output routing opened a lot of creative potential for my e-drumming. loading or internal sampling of my own sounds. I started loading it with all kinds of noise-bursts and struck-metal that befit the band’s aesthetic. a linear Pattern sequencer, up to 4 bars (64 steps) to play rhythms, melodies or drones from loaded samples. 3 effects processors per Pattern. kit “Eschaton” send just the snare-drum-trigger’s center, playing a “clang.wav,” to some some internal distortion, and my pad’s rim, playing a higher-tuned instance of the same “clang.wav” sound, to the KP2 path, to be play with, perhaps, a finger-sweep-able echo effect. Look out dub music, here I come. 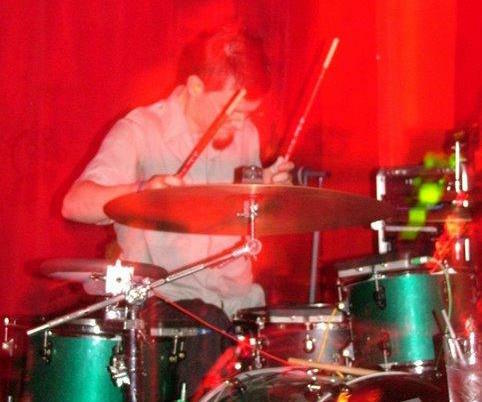 kit “Brew” could assign a slowed-down female scream to a foot-pedal, and route it to the KP-2 for me to capture live into the KP2’s memory, and then use the KP-2 to scrub and play like a DJ’s vinyl with one hand while the rest of me kept drumming . The potential for expressivity (in character and control of sounds) and personalization (to the ergonomic mapping of these sounds in my kit) was converging in a lucid way. I had long had abstract dreams that involved simultaneously muscle-ing the sounds as the player and twisting and capturing them as remixer, but the the machine (clumsy as it was at the time) was starting to bring these things to life. Next, I needed to make this now-spread-out technology easier to see and use from the drum stool. I found light-weight rack box with a pop-up angled set of rails. After some band-saw-ing and much velcro, I had a panel that could hold up the sound module in at a nice, visible position . recycled some 3U -tall panel (I think it held timer dials) donated from the scarp heap of SexDungeon studios. Thanks Dan ! Unfortunately, while the “instrumental side of this construction (“contraption”) worked as an instrument, it was too blocky and flimsy to take to punk basements, too small to mount steadily on a stand, and too short to use from the floor. I got an effects pedalboard from RoadCaseUSA.com and layed the ESX, the KP2, and triggerIO all flat, poised up to seated-elbow-level at my kit left. Above, you can see The Slab on my left, past the hi-hat. Big lit-up buttons and touchy Koass Pad effects are easy to play with drumsticks still in your hands. 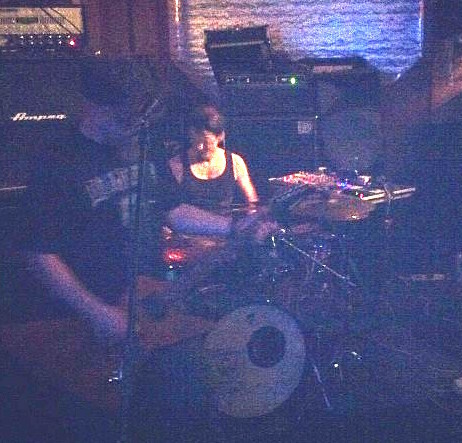 The Korg-based Slab was used at the last 2 WormRider shows a basement, and a bar (that had vocal-only PA), so it surmounted the above problems. After WormRider went on hiatus, Dan Consiglio and I (briefly) pursued more drum-machine driven music with PowerLoader, which pushed me to trade up to the Akai MPC1000 to sequence everything (bass lines, program changes for vocal effects, etc). each MIDI note triggered a drum “Voice”, made up not of just a particular instance and configuration of a single sound byte, but MPC voices were built from 4 assigned samples, each with unique tuning and mix, passing through 2 filters and a single envelope. Each voice had single LFO, which could provide periodic or random variation to a sound. The e-drum layer was starting to sound organic and alive. The the sequencer deeper. Arbitrary time signatures, with the ability to control start, stop, and jumping in and out of edit/overdub of a pattern with dedicated foot pedals. Now I had a (small) way to create and destroy robot-accompaniment to myself without having to stop drumming, let along put down the sticks. Each sequence stored multiple tracks, which could send their MIDI performance to internal Instruments (made of voices…), or out to external gear (such as my KP2) on dedicated channels. External Play tracks could also send a Patch Change / Program Change message as soon as the (hosting) Sequence was loaded, so now, I could set-and-forget each of my e-drum “kit” constructs dial in not just routing to the touchpad FX, but also automatically load the specific FX Program desired. YAY for automation. Thus, I could capture some sound, such as a bell, sample it, pitch it into a chromatic range, use the sequencer to program a motif, say a 7-beat melody, sample that into a Phrase, and then, as long as I sporadically tapped the pedal to keep the MPC updated on my time, I could re-trigger that 7-note bell melody, and the machine would play along to me ! Additionally, the physical form and hardware resources of the MPC1000 also a step up from the ESX in terms of it’s physical form and hardware resources. MPC is only 3.4 kg, almost a full kilogram heavier than the ESX, but…. Where ESX had a single pair of Sub-ounts, the MPC has a set of 4. MPC has two sets of MIDI ins and outs, so I could tie the KP2 effect unit directly to the MPC (to synchronize effects to tempo) and still have a set of MIDI jacks to capture my human drumming as stream of MIDI performance data (without having to bring a MIDI merger/splitter/router). MPC n being better equipped(with more room to the I’ve been impressed with how much room there is to grow within the MPC, both both as a “drum machine” and as a sound module. It has more outputs, and a more flush, road-ready interface (unlike the alarmingly fragile knobs and tubes of the ESX), and all in less weight than the ESX. Needless to say, those sporadic dreams of twisting sound choreographically started to feel less like abstract fancy and more like realizable blueprints. the glorious free-dumb of the small screen. Of course, before I even got the USB-equipped TriggerIO converter, I understood how much more power and flexibility might be possible (for cheaper) if I worked from a laptop….but the big screen has it’s own caveats. If I went with software, exploring and upgrading functionality would become a slippery slope of buying software and plugins that I not only may only use once, but cannot re-sell. I may even have to have to re-buy certain software just to keep it “updated.” Forget that. It’s considerably more economical to limit my budget to things I can hold in my hand; having something physically in your way is vital to creative exploration within/beyond it’s particular limitations. The drum kit was, and will always be, a way to get away from a computer (and the Internet) and pull blood back into my soul. I’m delighted to keep tripping over these electronic prosthesis as an extension of that practice. I’m (still) too attached to the way in which I dream up, tinker, and refine this drum-brain to just toss all that progress into the dimensionless void of some operating system. I believe my work here (as well as my prejudice) speaks for itself.